The Elstead Rectory black wrought iron Gothic twin wall light in style A offers a blend of wrought iron ruggedness and craftsman-made elegance to give a truly medieval appearance. 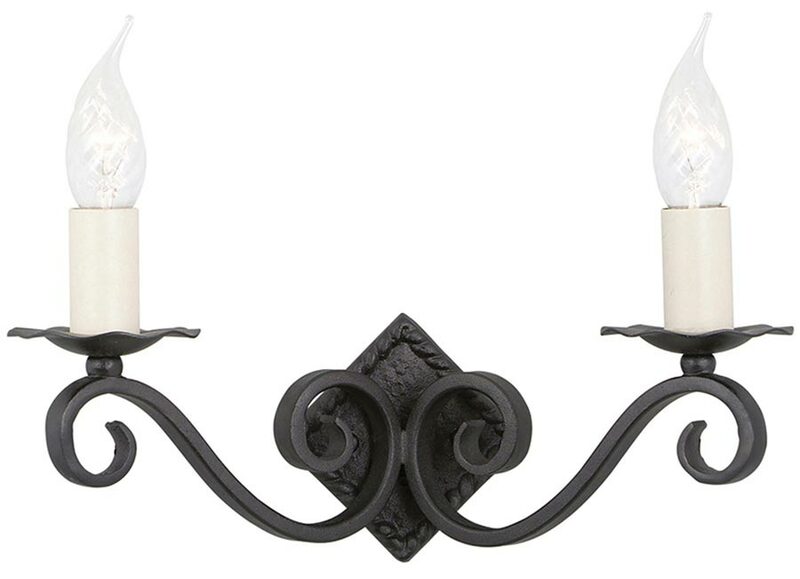 A forged Gothic style wrought iron 2 arm double wall light full of rustic promise. With a heavy forged diamond shaped wall mount and two double scrolled lamp arm supporting the candle style lamps. The lamps features a petal candle drip and off-white candle tube. All the quality and appeal of rugged hand forged items that are virtually made to last forever. This ironwork light is supplied by Elstead Lighting, a British company that specialise in the manufacture and distribution of quality decorative lighting such as the Rectory black wrought iron Gothic twin wall light in style A you see here.